Being the heart and soul of every home, the kitchen should be functional and have enough space to accommodate your family and friends. But since it is the center of the home and the hub of activity, your kitchen should also be visually appealing. This is why having it modernized is beneficial. 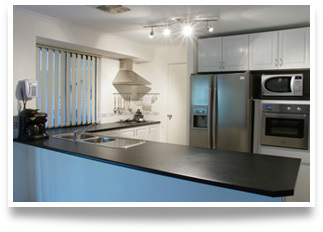 Below are some modern kitchen renovation tips to give your kitchen a fresher look. You need to set a budget first before planning anything. The types of the materials you are going to use for the renovation depend on your financial capacity. The design of your kitchen will also be affected by your budget. You need to spend money on labor charges, as well. Imagine what your dream kitchen would look like. Let your personality and preferences lead you when planning a design for your new kitchen. Be sure that it should both be beautiful and functional. Visit websites and read magazines to have concepts for the design of your kitchen. If you’re still undecided, try consulting a contractor or designer to have additional modern kitchen renovation tips. Make a wish list of the things you want for your modern kitchen. But be sure to consider the design and the available space. For a glossy and up-to-date upgrade, use solid surface countertops. It is more preferable by many people in kitchen remodeling compared to counters covered with tile. Obviously, solid surface countertops give a cleaner look with a wide of colors and materials. Caesarstone is one of the most popular countertops nowadays. It is beautiful engineered quartz stone made ideally for any interior surface. You can also choose marble as countertops but it is permeable and very soft. Use sleek, unembellished cabinets for your kitchen. Modern cabinets are usually flat, smooth, and uncomplicated. They can visually occupy up to seventy-five percent of the room that’s why having the right cabinets is very important. But if you don’t have the budget for new cabinet, you can still achieve a similar look just by replacing or repainting the doors of cabinet boxes. You can also choose translucent glass for your cabinet doors instead of solid. Any modern kitchen has high-quality appliances. Usually, these appliances are stainless steel. With its neutral finish, stainless steel appliance compliments with most modern kitchen design. Aside from that, it’s durable, almost rust-proof, and easy to clean. Have a visually interesting splashbacks. In a modern kitchen, they do not just keep splatters and spills from staining walls. Splashbacks could add beauty to the room with the perfect combination of colors and luminosity. Most modern kitchens have high-style faucets. Don’t limit faucet style to the conventional look because you have a lot of designs and sizes to choose from. Good lighting can add drama to the room. To make your kitchen look cool, use pendant lighting to illuminate your work surface. You can also put under-cabinet lighting to create a nice warm texture to the kitchen. Remodeling your kitchen will not just increase the comfort in the room but also the property value of your house. With these modern kitchen renovation tips, you can now start planning for your home’s new look.